As of 2006, the CJ-3B Jeep is 53 years old, the same age as the Chevrolet Corvette, which was launched at the GM Motorama in January 1953 (left). Both vehicles take their names from fighting machines of World War II: one was a term apparently coined by soldiers for the 1/4-ton reconaissance car, and one was the class designation for a small, speedy sub-hunting ship. Both vehicles were designed with some prudence during the Korean war, and consisted of a new body over a chassis built largely out of components already in production. Unlike the Corvette, whose newest version shares little more than the name and a sense of sporty style from the 1953 original, the high-hood Jeeps being produced under licence in India in 2006 are very similar to the first Willys CJ-3B. And even if you look at DaimlerChrysler's 2006 Jeep Wrangler, the heritage is obviously close. Still, in both cases there are lots of people who prefer the old Corvettes or Jeeps to the new ones, turning them into custom show cars or rock climbers -- or restoring them to their original stock condition. They're both very cool cars. But how "original" are those early Willys Jeeps that many of us carefully "preserve" or "restore"? What does "stock" really mean? These esoteric questions provoked a huge amount of thoughtful, funny and sometimes cantankerous discussion in three separate threads on the CJ-3B Bulletin Board in early 2005. So don't start reading this until you have some time to spare. Scott Blystone started it: "My '53 has a Solex carb, a 12V alternator/starter, and reproduction gauges from JC Whitney (all of them). Other than that, it's all original according to the manual (not counting the odd nut or bolt). So, how stock this vehicle -- 80%, 90%, 95%? "I read the eBay accounts of original Jeeps and then look at the pictures and laugh at the seats, the air filters, the mag wheels, etc, etc. "Just for fun, let's come up with some standards, like how many percentage points do we deduct for non-OEM parts. I vote 5% for a carb and 5% for an air cleaner. Is there a standard used in car show judging? "I guess the truth is only to be known by the observant with the right knowledge of these things." "My normal negative attitude towards re-engineering a Jeep notwithstanding, I am always willing to buy projects that someone started and did not have the time, talent, or money to finish. Usually they get it taken apart in very little pieces, lose some, break others, and then realize that they want out from under this Frankenstein. "I would never recommend re-engineering a Jeep -- I don't think it can be done and end up with a safe, reliable unit unless it is a custom shop that is doing the work. They usually have tens of thousands of dollars in the Jeeps they produce. Most of us mere mortals are just not willing to trade the down payment on a house for a Jeep. "That said -- I am always in the market to buy an unfinished Jeep project; I bring cash, but not much of it." Keith L: "I suppose you can use my '53 as the 'other end of the spectrum' example. "Fiberglass body, aftermarket screw-on oil filter (Scott, I haven't put the original type on that you gave me, yet -- it looks too nice!) seat cushions sitting on plywood, 4.11 gears, taillights flush with body, brake lines look(ed) like someone was trying to build a still, clutch pedal is the diamond plate type, the brake is rubber pad type (without the pad), heater type I've not seen anywhere (Firestone? ), olive drab... I'm sure the list will grow. "Can you get a negative score? "'Stock' means that no critical system in the Jeep has been substantially or materially changed from what was available in that model. So a V-6 in any CJ-5/6 would not count as non-stock, but it would be perhaps a 6.7 point deduction if the original engine was an F-4. "A V-6 in a 3B, on the other hand would push it below the threshold. I say that at the risk of reviving the argument that was on this page a year or so ago about the V-6 being available from the factory in the 3B. "A radio would be a .04 point reduction because as hard as it is to believe, it is not a critical subsystem in the Jeep. Single lever transfer case -.03 points, but why?? Wrong body tub on the frame -99 points"
Glenn Houston: "Well let's see, there has only been one Jeep on CJ3B.info that (maybe) we can all agree is or was original and that would be Ed Surjan's 1963 CJ-3B (formerly Adam Charnok's). So if we can agree that it is 100% and then you take off 2% for each and every item that is not original, and that means everything that was not on your Jeep when it came off the floor at the dealer, what will you have left? Well, mine still looks like a 3B but I come up with a -246%. I'm sure there are alot of 3B's that are closer to original then mine. But if you count every nut and bolt and everything, the winner maybe close to 0. There may be one sitting in a junk yard for the past 50 years -- a pile of rust, but it could be original." Nick: "What if we were to change the direction of this argument a little? If you're trying to find a Jeep that's 'original' then good luck -- this argument may be more suitable for the MB/GPW type of people. "I'm wondering this: does a Jeep have to be original to be stock? I don't think so. If not, then perhaps a stock setup would be a more suitable starting point for everyone here. As far as my points system works, modifications that are easily reversible -- bolt on items -- that work with and don't otherwise interfere with any other existing systems are nearer to stock than irriversible mods that include cutting, welding, etc. "I'm not really sure where I stand on how many points to deduct for what. For me, being able to see a relatively easy transition back to stock form, no matter how many modifications have been done, would still add up to less points than one single mod that can never be undone. I don't think a Jeep has to be original to be stock - within reason of course." Glenn Houston: "Nick, I think you will have to define original and stock. Stock sounds wide open and most anything that has a few Jeep parts could be called stock. On the other hand, original is a little easier to define. When the Jeep was built the parts that were on it were original. If parts were taken off another Jeep and were the same model they may be original also. If new unused parts were found also from same model they may be original too. But all the aftermarket parts that are out there are not original and all those add ons are not original. "Then take out your list of parts and add up all the parts it took to first build this Jeep. Then add up all the parts on the Jeep that are not original and you will have your percent of original. It is going to be a little hard to find original tires, shocks, and batteries. We can then give a bar of ivory soap to all that have a 3B that is 99.44% original or better." Scott Blystone: "Well, this is fun, but no arguments yet. I would consider original as meaning this is the parts it had on it when it rolled off the assembly line. Only Adam Charnok's (now Ed Surjan's) '63 (right) would come close here I imagine (I think it even had 1963 air in the tires). Stock to me means it is equipped as it came off the line, so an F4 is an F4 even if it came from a later vehicle (however you lose points if the PVC valve is a draft tube). "I think the only thing I like better than seeing a really close-to-original Jeep is pointing out the inaccuracies in those that aren't. Nobody said anything about gauges; I know very few of you have all original functioning gauges. Some of mine were OK, but I decided I would rather have them all match so i went with the JCW set. Did nobody mention it because you all feel sad for me or are you all running those chrome-rimmed hot rod gauges? To me those (and their orange needles) are most offensive in a Jeep dash. I think radios are abhorrent as well -- a waste of money given the sound quality of Jeeps anyhow. "I forgot one other non-stock item -- my steering gear is from some other vehicle and does not have the tube for the horn wire (military Jeep source?). I'd love someone to donate me an accurate gear!" Wes K: "To get back to Scott's original question -- how to determine what percentage points to deduct for non-stock items. When he said percentage points, are we talking how many scoring points to deduct from a possible perfect 100% score, or what percentage of the Jeep's original stock 3,456 parts remain in the Jeep? "If the system is from a perfect score of 100% then press on with the many ideas of how much to deduct for say a Solex, or electeric wipers. "If the system is what percentage of the original Jeep remains, then simply add up each missing stock item and subtract it from the total number of listed non-optional parts in the parts list." Nick: "Glenn, you asked me to clarify myself a bit, so here's what I think. I see original as the stuff it rolled off the lot with, though I think your view of that is a bit different. As for stock, I see that as including replacement parts as long as they are the same. If your F-head's block gets a huge crack in it and you replace the block with another of the same, I think it's still stock. You can still work on the replacement F-head from your shop manual, can't you?" Jyotin: "I saw that there were 3,456 parts in a Jeep. I found this hard to believe, so I went out to the garage last night and counted them. Lo and behold, I came up with 3,453 parts. So my Jeep has 3 fewer parts. So I counted them again just to make sure. Still 3 parts short. Perhaps I have a limited edition 3B. Do all Jeeps have two headlights? Did all Jeeps come with fuel gauges? I always thought it was difficult to see when raining with that single windshield wiper in the center of the windshield frame.
" -- Jyotin (missin' three parts)"
Tim Salkeld: "Been lurking on this for a while and have a quesion. Would original or stock apply to the aftermarket PTO winch that my 3A had when I bought it? It is is a Ramsey model 100 so is the the correct vintage. I have no documentation to say that it is a factory install or dealer install. Would this be a reducton in the 'stockyness' or would period pieces actually increase the stock 'potential' and one could create a 'uberstock'? Reid, you still out there??" Jeff Taylor: "This always makes for a good discussion. I too find it odd when I look at an advertised 'all original' Jeep and find it with white spoke wheels, paper air filter, different seats, roll bar, etc etc. I guess/hope that most of the time they just don't know any better. My 2A is as stock as I want it to be, all of the same accessories except I have added an overdrive, 12-volt conversion and front hubs, and just tonight a vacuum advance distributor (runs sweet). The rest looks as it should, but that doesn't mean the seat covers are original or the radiator has the same core or for that matter the engine hasn't been rebuilt. I assume that there are professional judges that could help with the determination on the difference between original and stock." Anon: "3B stock with electric wipers. Some had radios as dealer installed option. 15' wheels vs. 16', 6-volt vs. 12. 60/40 front seat vs. twin 'buckets'. Different seat material vs. gray or black. Not all 3B's were created equal; farm Jeeps vs. three-seat people mover. Stock options on one would be unoriginal on another. What about hardtops from dealer or 'OB' with a top. Vary is normal in Willys so Charnok's is not the only 100% original out there." Wes K: "Jyotin, The 3,456 number I pulled from you know where. It was simply meant to quickly represent the total in the manual for a specific serial 3B not counting any optional or aftermarket equipment. The count would differ slightly depending on 3B serial. "Anon, I prefer to keep 'original' in context with 'as it left the factory door'. The degree of 'original' depends on pickiness of judge or owner. I believe 'stock' is simply a unit that has all the same type equipment it left factory with. At one point 16" wheels were stock and 15" were optional then a little later the factory switched it to 15 stock and 16 optional. 6-volt was stock thru 1957 then became optional to the stock 12-volt system. "Ideally the owner would have the original factory-delivered invoice (left) listing all equipment provided. If the Jeep still conforms to the factory original invoice then it would be an original Jeep. If it has added factory or dealer options listed in the parts manual or factory service letters it would then be stock. If the same Jeep had a small block Chevy installed it would become a 'modified' Jeep. If it had a JC Whitney plastic gas tank installed it would then be a modified Jeep. "To simplify the system even further, anything on the Jeep not listed in the factory parts list makes it a modified Jeep." Glenn Houston: "Wes, I think you have made it pretty simple. We would now have maybe one or two original Jeeps, a dozen or two stock Jeeps, and a whole bunch of modified Jeeps. Well a modified Jeep is better then no Jeep at all and if I'm going to drive it much I'll take the modified one. Brakes that work and an overdrive are a much needed addition." Scott Blystone: "Well, if nothing else, perhaps this discussion will limit the number of ads that start with 'mint, all original!' and end with the words 'bucket seat' or 'game rack' or 'Superlift'." Keith L: "Has anyone considered what one of the 'premier' auto shows is like? I'm talking about the Pebble Beach Concours D'Elegance. This is the 'See and be seen' auto show. Look at some of the winners. I can't help but think that there is no way that all these cars are showroom original. They look showroom new, but that means new paint, re-chromed trim, REPLACED parts, etc. So as long as the parts were made for that vehicle, and is true to that period in time, it's not 'modified'. So i believe that one could build an uberstock CJ-3B." Rocnroll: "You guys really have waaaaaaay too much free time! Is this what happens when you get into 'original' Jeep versus 'modifying' one -- more computer time and less garage time? (Don't get all up in arms, it's just a joke.)" Glenn Houston: "According to Wes K, Scott's Jeep can't be stock. It falls into the big pile of 'modified, but maybe only a little bit modified.' There is another name that hasn't come up and that is 'restified' -- that was what Derek called my '53 Jeep, but Derek may have been trying not to hurt my feelings and really meant grossly modified. "We could split 'modified' and have 'functionally modified', and put all the overdrives and 11-in. brakes and a few other items into that one. "Yes some of us do have waaaaaay too much time, but that might happen when you get old." Rocnroll: "The ones that always kill me are the ones (not only Jeeps) that are 'restored'... with rollbars, different from factory paint color, wheels, brakes, engine modifications and on and on. I just hate that term when applied to anything that has been 'fixed up' (oh no, there's another term). "I gotta get back out in the shop....I've almost been sucked into this conversation and I don't even have a 'stock, original restoration'! Well, if nothing else, perhaps this discussion will limit the number of ads that start with 'mint, all original!!' and end with the words 'bucket seat' or 'game rack' or 'Superlift'. My '53 has a Solex carb, a 12 V alternator/starter and reproduction gauges from JCWhitney (all of them), Other than that, it's all original. "So the Jeep on eBay has Bucket seats, you have Solex... Jeep on eBay has game rack, you have 12 volt system... Jeep on eBay has Superlift, you have repro guages from Whitney. How can you say your Jeep is more original?" Bryan: "I just like telling people I have an 'old' Jeep. Its a '54 3B that hasn't been fooled with tooooooo much. Original engine and drive train except for Solex carb. Nothing in the drive train ever taken apart and rebuilt. Original seats and even seat covers. Original gauges. Even original sealed beam headlights believe it or not. The Jeep's been in the family since it was brand new. Grandfather bought it new and my father drove it out of the showroom, so the history is well known. "For the fooled-with parts, besides the carb; it has a roll bar, 15" white spokes that will go away when I find one more 16' rim, and new NACO tail lights that are 2A or 3A style. Plus a reverse light. Does a complete rewiring job lose points? How about a plastic gas tank? Jeep was painted an awful red in 1974 that covered the original cool red, but that is soon to go too. So, some original, some new, but to most just an old Jeep. "My opinion is you start to lose the big points when you alter the drive train, suspension, frame, steering; the main things that made an old Jeep an old Jeep. The little add-ons for safety and reliability (roll bar, seat belts, steering stabilizer, carb, plastic tank to keep rust out of your fuel pump) may take off points, but should compare to the big things that turn the old Jeep into a new Jeep with an old body style. Just my $.02." "Rocnroll: "My opinion is, you start to lose the big points when you start worrying about what you're losing points for, and not getting as much enjoyment out of the vehicle because of it." Bryan: "Hey, who's worrying? When I'm driving down the road hanging on to that big steering wheel, with the sun burning my forehead, listening to that Hurricane whining, and really leaning into those undersize brakes at the lights, I'm not thinking about points. But it IS something to talk about, isn't it? "I enjoy talking about the old thing as much as I enjoy driving it (and even working on it)." Rocnroll: "EXACTLY! (Wasn't inferring you were worrying, but there ARE those that do.)" Mike: "The sad thing is it could be all original and it is still only worth maybe $5,000. It's not like a '57 Chevy, Super Bee, Mustang etc. Don't get me wrong, I like my 3B but if I had 8,000 - 10,000 extra cash that I didn't know what to do with I would get a modified Vette, Mustang etc. before I got a 100% original 3B." Rusty: "Lay the windshield down, put it in the wind. Then stock, original, modified are all the same -- it's about the ride. My personal favorite Jeep has air in the tires with a running engine." Ed Wilson: "I'm getting in kinda late here, but this is fun! I'm finishing my '54 rebuild which included the repro body, 12-volt alternator conversion, AutoMeter gauges w/tach, braided stainless brake lines, Painless wiring harness, LED tail (flush) and front turn signals, halogen headlights and Speedliner sprayed all underneath and inside. I already had 11" brakes, Pertronix ignition, K&N air filter and a total mechanical rebuild (engine and all running gear). "I built it the way I perceived my needs, and a nod to safety as it is Viper Racing yellow, high visibility. "Original? Na. Restored? Nope. But I hope a good solid, safe flatfender. I'm 56 and this is the Jeep I'm going with until death do us part. Andrew Stock: "A 'stock' vehicle would be one that has not been substantially modified and the aftermarket parts are those availible when the vehicle was new. I know it's not a 3B, but let's use my 1954 475 Pickup as an example. It was originally purchased by the township I live in. After I ended up with it, the engine had been overhauled (supposedly it's original, serial no. 1T51955), a Warn OD had been installed, a fire extinguisher (last recharged November 1964) was bolted to the rear cab wall, and a Bendix electric fuel pump (shot, will be removed and a mech. one installed). Oh, I suppose the 6-gallon boat gas tank chained to the step bumper to replace the original tank would be a modification also, and the three different colors of paint the truck accumulated over the years. "Let's see... The OD is a very common addition, especially on pickups. The fire extinguisher is period-correct (and functionally useless). I suppose the truck can be considered 'stock,' far from 'original,' of course, but functionally 'stock.' By the way, 36, 200 actual miles on the truck." Charlie C: "I remember the discussion about restore vs. modify as it pertains to 3B's. I'm more in the purist camp, but I can't argue with safety issues. My question is: If I buy a repro tub, and everything else is original, do I then have a restored or modified vehicle?" Ed: "My short answer is modified. Now for my long answer: If the repro tub was TRULY indistinguishable from an original an argument could be made for calling the Jeep restored. But no such repro tub exists so it's a moot point. "Essentially, if you change a major element of the vehicle (say, a body tub) with one that is not authentic or a dead-on accurate replica, it gets harder and harder to descibe the vehicle as 'restored'. Sadly, this term is so loosely used in the old car hobby that almost everybody just applies it however they see fit. But, if you are dealing with serious guys that know their material, a much stricter definition will be used. In ads found all over many, many Jeeps are hyped as 'restored' while nothing could be further from the truth. Fixing what's broken and making it look nice qualify as repair, not restoration. Add in the usual bunch of non-stock stuff and mods and, well, it just is not restoration. Nothing necessarily wrong with what was done but instead in how it is represented. "Having said all of that, what it really comes back down to is not what a guy like me or anybody else says -- what matters is how you answer the question. My suspicion is that in asking, you already know the answer that is right for you deep down inside. No matter how many people say otherwise it is best to listen to that voice as decisions are made on your 3B to avoid regrets later!" Jerry Brown: "I fully agree that changing tubs or engine components is major surgery, but Jeeps are a little different than most cars. Suppose a Jeep is 100% original but has WARN hubs, winch, or overdrive. Does that mean it is not original? What if it has a canvas or metal cab, or a rollbar? Consider that even the passenger seat was a optional extra on a pre-AMC Jeep. If you take away all those modifications you aren't going to find very many originals." Oakes: "Many of those are Jeep approved accessories. Jeep didn't make the Koenig hard top but it was a Jeep approved accessory. It's when you put an overdrive on a 2A, when they were not available until later, that you are now modifying the vehicle. You can call it 'restified', which is modifying using period modifications. The 225 V6 swap is a period mod. A Vortec is not." Jyotin: "Louis Champeau, you've got it right! Very few collectors are interested in modified vehicles." Ed: "Jerry, the 'mods' you mention (WARN hubs, winch, overdrive, tops, factory rollbar) are Jeep-authorized accessories and special equipment. These can be found and definitively documented in Jeep catalogs, manuals, brochures, service bulletins and other factory literature. Jeeps with these can and should be considered original if the accessory or equipment is correct for the year. The types of non-original 'mods' I was describing are, among others, the repop steel and fiberglass tubs, lift kits, power steering and brakes, etc. that were never on a vintage CJ when new." Boyink: "Maybe 'collectors' aren't interested in modified vehicles, but based on the number of custom car shows, magazines, and aftermarket suppliers for parts, there's plenty of interest out there! Does owning only one such vehicle make a 'collector'? "Personally I love looking at 'em both, but if it's mine and will see any use other than shows it'll get modified for safety or mild performance gains while trying to retain an 'original-ish' appearance." Ernie: "'Restored' is a very loosely used term and everyone has their own thoughts on that. I have always felt that restored is to bring something back to as original as possible, using as many orginal parts as possible and available. So a repli tub in my estimation would not be a true restored Jeep since there are so many good examples of original bodied 3B's out there. But if one was working on a one-and-only type vehicle you would rebuild it with what you had or could find, using whatever information one could dig up and that would be the best that could be done. So if it's not as original as possible, I call it rebuilt or restified. But I have always said that one should do what's right for them and get what they want out of their project. And as for the mods, if they are appropriate for the era that's icing on the cake!" Glenn Smith: "While on one hand I tend to agree with the theories on restoration, in reality how many 100% restorations are out there? To do it correctly one could only use material for seats and such made in the same year as the vehicle, and only thread to sew the material made in the same year, etc. You could only use stickers made in the same year, bolts, brake shoes, etc. If period-correct is OK for a restoration, then why couldn't a repro body that looked identical to an original be used for a restoration. Personally I don't think that is any different than putting a '55 body on a '53 and calling it restored, or any different than welding in new panels in a body and calling that restored." Glenn Houston: "Well this is becoming a real problem so I think there is only one thing to do. We must ask the government to step in and take care of it. They will need to hire inspectors to look at all the 3B's and give them a rating as to how original they are. They will have to say that all 3B's are original and then rate them starting at 100%, 99%, 98%, 97% etc. If we do not say they are all original that will upset a lot of people. I'm sure that Mr. Bush will go along with this because he loves to spend our money on some of the darndest things. It would be no different than inspecting potatoes or onions. This would also be good to cut down on unemployment. "But on the other hand there are a lot of 3B's in other countries so maybe the UN would be the place to go. The US could still pay for it and that would make Mr. Bush happy and the UN has a lot of unemployed inspectors." Jerry Brown: "Well, just to keep this going... Actually, until the mid 60's or so, the Jeep-endorsed hub was manufactured by Cutlass industries, not Warn. Cutlass even used the Jeep logo in it's advertising. The overdrive was not developed by Warn until 1963, so it is certainly not a period correct addition for most CJ-3Bs (mine included). Roll bars were not an option at this time, either. Most were made in high school shop classes, with commercially-produced ones appearing in the late 60's. The only accessory items referenced in my various Jeep service manuals printed in 1953, 1958, and 1968, are pintle hooks, heaters, PTO's, and governors. "I've done all I can to keep my 3B as original as possible, but during its 42-year life it has it has acquired an overdrive, roll bar, seat belts, steering stabilizer, and the tub was replaced by the prior owner in 1984. Never pass as absolutely original, but it's still a very nice example of a 3B and usually the oldest Jeep I ever see in the backcountry. "Now that there is a federal law mandating seat belt use, original 3B's aren't even street legal." Chuck DeHut: "Fellas -- For sale. Cutlass Hubs, one works, one don't. One roll bar (made in shop class). Has seat belts, front only. They look original. Bondo and body work. What bondo?? Need OEM rear view mirror. Have mounting bracket. Only rust is around the original top bow brackets (brackets MIA). Need OEM late model period taillights. Have original factory option heater/defroster. And the rear seat with original looking gray vinyl under the cracking black vinyl covering it now. Still need vent window rubber. It is about original as can be except for what's not." Chuck: "I started this thread because I feel that this type of open discussion really benefits our hobby while providing much insight to the 3B in particular. While Jerry is right on the head with the facts about options, I think you cannot rule a vehicle as NOT a true restoration based on aftermarket options. Since vehicles have been built, people have always added their own personal touch, or options. That would be getting so specific as to rule out ANY vehicle as restored, as Glenn Smith states. Usually, in regard to restored vehicles, there are several 'classes' differentiating the restoration (i.e. factory restored, concours restored, etc.) It should also be remembered that oftentimes a vehicle would be purchased with the 'options' added at a later date as time and finances allowed (or as the owner aged and creature comforts were deemed more urgent). "But Jerry, the federal law is NOT retroactive on the use of seatbelts (or turn-signals). My 3BOB is running regular VA plates with all its stickers, including the inspection. It predates signals and seatbelts. (However, a cop can pull you over for failing to signal if you don't use the hand signals!) 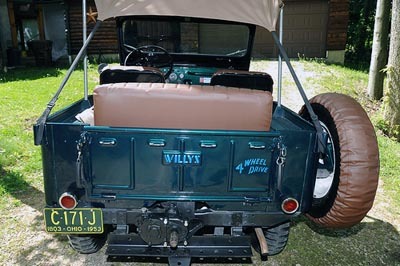 Of my three Willys, I would rate them as one in each category, that being restored (or soon to be), restified, and modified. Always good to have an example of each even if none are 100% factory original, as NONE are." Glenn Smith: "I'm glad my point was understood as 'how specific do you want to get', and not a cut at the fine work many people have done. I'm proud that so many guys love Jeeps like I do, and like discussing problems they're having and theories they have, such as this topic (and the OB topic is another good one.) One thing I'm pretty sure of, is I doubt there's any disagreement on the post that started this discussion." Jerry Brown: "The federal seat belt law is only indirectly the problem here in CO. The feds have threatened to withold highway funds for any state not enforcing an active seat belt law where not wearing the belt can be a prime offense. The legislature here passed a law to comply, and as I understand it, it applies to all vehicles, period. Probably different in different states. I'd have seat belts in my vehicle (right) regardless and always use them. As a EMT I've observed what not using them can lead to, and they are in both of my Jeeps. They were stock in the '68 CJ-5, but not in the '61 CJ-3B. "I agree about the value of these discussions. This subject comes up now and then and it's always amazing to see how people jump right on it. It's also interesting how the concept of having an original (as possible) vehicle differs from person to person." Chuck DeHut: "With the changeover from W/O to Kaiser, who is to know what is factory original or factory option or aftermarket add. Looking at my seat belt connections to the tub, they seem to have backing plates that look like they could have been factory installed. They are what looks like a nut welded to a washer welded to the tub. They seem to be period belts meaning not much more sophisticated than what you use on an airplane. Also I have a windshield washer nozzle centered on the cowl with what appears to be a factory Jeep labeled fluid bag. Mod or stock?? If you can find tub mounting kits what would OEM be? Rubber? Probably not nylon. I feel restored is keeping it as close to the original intent, but certain items will be darn near impossible to replicate without sending the cost through the roof. Sometimes mods are an upgrade for safety also. If I were to sell it I would probably go with your line: original as possible." Jerry Brown: "I bought a '69 CJ-5 V6 new in 1969 and it came with factory belts and the windshield washer exactly as you have described it (a bag with a foot pump.) My '68 CJ-5 doesn't have the washer (unfortunately) but does have factory belts. The belts must have come along between '61 when my 3B was built without them and '64 when yours was built with them. I owned a '64 CJ-5 for a while and it had belts, but I don't know if they were added or not. I seem to remember seat belts being mandated in California before elsewhere, so they might have appeared out there first." Chuck DeHut: "Foot pump, what foot pump? I was wondering how it was supposed to work. Crud, another mystery to solve." What Does Preserving a CJ-3B Mean? Bryan: "It has been suggested I should preserve my CJ-3B, in other words put it back to its original condition. However, If Jeeps are like other classic cars, this means one must have all matching numbers on the automobile to class as 'original'. If numbers don't match the value drops upwards of 30% and all you really have is a 'replica' not an 'original'. If one looks at other classics, you will find that 'non matching number' autos are usually modified to better enjoy them. Once you change a body part, engine, trans, or anything else, it is no longer original. Why and how are Jeeps different from other classics?" Anon: "Preserving means if it ain't broke don't fix it. Leave all working parts alone. When you have to replace broken items us NOS." Bryan: "And if nothing is working what does one do? If nothing is original, except for the body (which needs a new hood and front floor pans at least), why build a replica? Keep in mind, I haven't done a thing to this Jeep. I'm just gathering ideas for it. I'm the first to keep an original... original. But if isn't an original, why build a replica when one can build a head-turner that promotes the original BEAUTY of the CJ-3B? I love the look of the CJ-3B -- that's why I bought one." Anon: "At some point in time the Jeep does lose its value. Like a rare stamp, if it should become torn or should begin to decay, it loses its value. Only thing to do then is to put the stamp back togather with scotch tape and enjoy it as before." Bryan: "Anon, It seems to me that if a person has a 'Monet' that is defaced, torn, and is unreconizable other than Monet's signature, it's not OK to repaint it yourself, put it in a fancy frame, and tell people 'I have an original Monet'. It's different to me when all is orginal, the numbers match, and one has to touch it up, or maintain it. But once you change motors, body parts, trans, axles, and everything else on a Jeep, then it's impossible to call it an original. I'm saying, do what you want to Monet's painting, as long as it looks good hanging in the living room. Cut out Monet's signature from the painting and cherish the fact that you now have Monet's autograph. That's a lot more valuable by itself, than having his signature on a screwed up painting. So take a screwed up Jeep, fix it up, modify it, have it looking good on the wall if you will. "Cherish the fact that you implemented your ideas and created something that you like. Strangers, sons, and friends worked together to accomplish this goal. That you took a sad automobile that was once great, and made it better. Because the memory of doing that, is my Monet's autograph." Glenn H: "Preserving is very important in this country; just look at what the US Government is doing. The State of Idaho is about 75% owned by the federal government. We have wilderness areas that no one sees, roadless areas that no one drives in. We don't cut trees anymore, we don't dig in the ground anymore. We now have wolves back to eat the deer, elk and cows. We may get grizzly bears back. They tell us we are preserving all this land for something. So maybe if you want to preserve a Jeep you can store it away in grease and in another 50 yrs. think what you might have? I have made some changes to a 3B that was close to worn out in 'original condition'. I'm sure that many 3B owners will call me a butcher and I shouldn't be allowed to own a 3B. Well to each their own, that's what makes the world go round." Anon: "I say make it the way you want. Let's face the facts, even if you have a Jeep with matching numbers, what's it worth? Maybe an extra grand, we are not talking about an early 60's Vette, an early 70's Super Bee, a 60's Mustang. I have a pretty much 'original' 3B. But I would rather enjoy it by what you want in it, than place it up on blocks to look at, making sure every nut and bolt are original. I am sort of disappointed in Jeep for their lack of improvements that other manufactures took advantage of in the 50's." Bryan: "I was really curious as to what CJ-3B owners feel about their vintage Jeeps, to learn, and to get ideas. There are apparently two schools of thought as far as restoration. In my humble opinion, both are right. Being new to the forum and a first time owner of one week, I was asking questions as to how to restore my Jeep the way I wanted it. Instead I get certain suggestions that maybe I should sell my Jeep to someone that would appreciate it, or maybe get a newer Jeep, put flat fenders on it and do something with that. All I was asking was what modifications I could make to my drive train, and what was the best thing to do with what I have to work with. This isn't the way to grow the group and make new folks feel welcome." Jon: "Bryan, first and foremost, do whatever you want to do with it, it is yours. I myself have a '60 3B. It was beyond 'restoration' when I got it, but even if it wasn't, I would still be lifting it to kingdom come, shoe-horning mass horses under the hood, and throwing some 36' swampers on it. Just because I want to. Had I wanted something that was original, I would have bought it that way. In my case, I didn't care. I love the way that the 3B looks, and that you hardly ever see one one the road. And being an engineering student, I have a hard time leaving things alone. I am always looking to make something bigger, more powerful, etc. Having just returned from Toledo though, one could appreciate having a completely original 3B, as your standards suggest, after looking at the ruins of where these rolled off the lines. It was neat knowing though, that even if my Jeep is not completely original, I still have a few pieces of what is now history. I have looked at the pictures on CJ3B.info of the demolition, but they do not compare with seeing it in person. If anyone is in the vicinity, I highly suggest stopping to see it. It will make all of us appreciate what we have, completely original or not." Wes K: "Bottom line here is, to each their own opinion. This means thicken your skin for both those who agree with your opinion and those who don't. There are the purist restorers and the dramatic modernizers and they both visit here and both can learn from each other. Waste not your time attacking the other's opinion. Instead spend your time stealing his thoughts which you may be able to use, and shopping the thoughts of others. "I wonder where one gets this list of 'matching numbers' for a CJ-3B? Many automakers kept very accurate build records on their vehicles and even included serial numbers of some components on documents or data plates that came with the vehicle. Willys was NOT one of them. The only place you'll get a 'matching numbers' extra point on a resto with a Jeep, is with a Ford-built GPW whose engine serials matched the chassis serials." Glenn Smith: "Definitely, to each his own. If someone buys a basket case, or maybe a parts Jeep and puts their own personal touch on it, whatever it is, that's their business. It does make one wonder why people take a complete Jeep and then change basically everything on it except the frame and body. They buy a Jeep because they like them, but then don't like anything about it 2 days later. It's still their business of course, and I hope they enjoy it. Personally I don't call it a Jeep if it's a Jeep body sitting on a Chevy drive train, but I certainly don't condemn it either. My T-90, Spicer 18 T-case, and D-25 and 44 axles do just what I want and expect out of them, and the F-head has the power I expect out of it. Whatever you do Bryan, do it safely and enjoy it." Bryan: "This is great; now we are getting some good discussion. I want to read topics and others' opinions. I know I can learn a lot from you guys. Though I may be doing something unusual with my CJ-3B, I still need technical advice, and ideas as to how to make certain things work. As mentioned earlier, saftey is a priority -- I'm to old to hot rod around. The CJ-3B that I'm working on will more than likely be trailered to shows, except for the occasional drive to the mountains with my wife to do a little fly fishing. "Wes K, you answered my question 'How are Jeeps different from other classics?' So, Jeeps don't have manufacturer matching numbers? If that is true, then it shouldn't hurt the value of the Jeep as long as the original equipment is used for repair or replacement. Right?" Glenn Smith: "Unless someone is 'restoring' one to make it valuable, value is irrelevant. What it's worth to you on a personal level is what counts, and chances are you would never get all your money back if you sold it anyway. A correct restoration to me is using only what was available the day the Jeep left the factory. Virtually anything else would be a modification, even if it's a cigarette lighter, or a piece of chrome that was added on. So in that respect mine is certainly modified, and I'll bet you that at least 99% of the 'original' Jeeps out there are modified, however slight it might be. What do you plan to do to yours anyway, I haven't seen any mention of ideas so far -- or did I miss something?" Bryan: "Glenn, I don't have much to work with and still have to check out a couple more things on the Jeep. This is what I know: it has a Chevy 350, 4-speed trans (which is only a 2 wheel drive now). It apparently has a Bronco rear end, the hood needs replacement, and the front pans have holes in them. My thoughts: since everything has been modified I thought I would go ahead and finish the job, but to show quality. I have a couple of trucks that we show in NOPI regional and nationals, so I thought I would finish the Jeep to that standard. I can't decide to fix the body or buy a new one. "I don't mind keeping a 350 in the Jeep, but just not the one that's in it. But that leaves me with other questions. If I keep the 350, then what's the best trans and transfer case to use, and by using the 350, will that allow enough room to add new power steering, a/c, and power brakes. I'm hoping that someone can suggest a nice drive train combination (which I have received a couple) that could possibly work better, but still has a certain show appeal. We will be adding digital instrutments, GPS, and other toys. "If the Jeep was closer to original I would go back to an original restoration. In short, we are going to build a show Jeep. I want it to be safe and comfortable to drive, but it must be a unique head turner. I'm now thinking about buying another '55 CJ-3B and restoring it original and showing both as sisters. One original and the other customized and modified! The current Jeep would be mainly trailered to shows, except for local shows and the occasional drive to the mountains." Glenn Smith: "If you mainly show it, would you even need 4WD? I've never been involved in what you're talking about as far as what would fit, but if you keep the rear end in it, that would dictate what style transfer case you use, so you can start from there as to what would fit. Unless the body is beyond repair, don't scrap it. If you don't want it, offer it on this BB -- someone will want it. Bryan: "I would prefer putting it back to a 4x4, after all it is a Jeep, well kinda! As to the rear end, I don't know what to do, keep it or chuck it! I don't know enough about the mechanics to know why someone would put in a Bronco rear end, front what I've read one can't beat a Dana 44 - 60, so once again I don't know. The bad thing about a Chevy motor is that the distributor cap is towards the firewall. I'm also thinking about the Dauntless 225, but have read that it idles rough, and also thinking of some possible Ford motors (not sure which Ford would fit). "The body, well I would like to keep the body, because overall it isn't too bad. With that being said, my lines would be a lot cleaner with a new body and for 'show' that's pretty important. With the body I have now, previous owners have cut up the dash for stereos and what not. Again, still trying to decide on the body. This Jeep has apparently been painted 3 times from what I can see, I'll probably save 200 pds off the weight by sand blasting. If I keep the body, I'll have close to $1500 in cutting, welding, and blasting. A new steel body is around $2300 landed, which means no bondo and no missed rust that will come back. It's hard to decide!" Jerry Brown: "In my opinion, the Dauntless V6 is a great engine. It also was offered by Jeep, so you have lots of compatability. You can tune them so they idle just fine. If I were to put a different engine in my 3B (which is basically stock), that's the one I would choose." Edgar Daniels: "I loved this discussion. I've only been coming to this site for about a month. I'm a 3A owner and sometimes feel like an outsider but I appreciate all things old. Build your own Jeep the way you want it. I've been around antique cars and anything else antique all my life and if there is one thing I have learned it is this: Anything you have antique or not is only worth what someone else will pay for it, no matter what any blue book or publication may say about it. "Example: I have a '68 Chevy pickup I bought from my dad. He bought it for $500 in 1970, I bought it when I was seventeen. Since I've owned it I have watched it go in and out of popularity. There have been times when I could have sold it for seven thousand dollars (it is restored) and other times when nobody would give me a plugged nickel for it. It doesn't matter; it's not for sale anyway. People are sheep; they only want something because they saw a piece done in Hot Rod or OffRoad magazine. When they realize it's work they grow tired of it and leave it alone. You have something that is in its own right beautiful, and a website full of people with knowledge and experience willing to help you (even though they can have harsh opinions, they help anyway.) Build your own Jeep, stick with it, make people talk about it. Good or bad, they will still have to talk about it." Bob: "I agree with the opinion that 99% of the 'original' CJ-3Bs out there are not truly original. Modern paints and body work supplies are much better than they were in the 50's. My '53 (right) is about 95% stock. I put in the electronic ignition and have all stainless fasteners throughout. POR-15 paint on the frame and a spray-in bedliner. I was going for the original look, but wanted it to live to be 100 years old. I suspect most Jeeps of that era were no longer stock after just a few years. People added radios, lighters and other junk to them. I have to admit that in my opinion, when I go to a car show I am much more attracted to a vehicle that is restored to original (or as close as one can get) than I am to the highly modified vehicles. I appreciate the work that people put into them, but they are still not as nice looking as when they came out of the factory. In your case, since the Jeep was nowhere near stock when you got it, it gives you somewhat of a licence to do what you will with it." 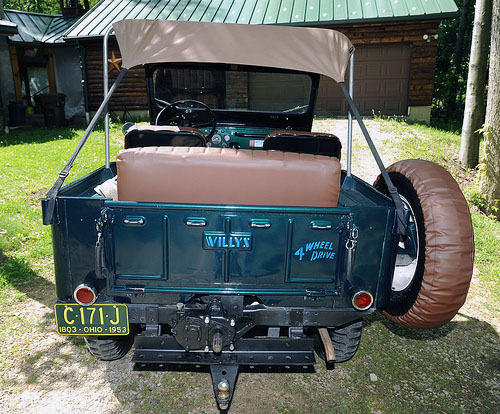 Jerry Brown: "If you really want to get serious about this, the 'stock' Willys Jeep came from the factory with only a driver's seat, no top, no hubs, no back seat, no PTO, no winch, no overdrive. These were all add-on accessories and were purchased from and installed by the dealer at additional cost. (I bought a new CJ-5 in 1969 and learned this one the hard way -- I remember being really griped at having to pay more for a passenger seat.) With the exception of the passenger seat 'option', these things were never even made by Willys. So if you really want a 'stock' Jeep as it came from the factory, you'd better get a good raincoat to take along." Edgar Daniels: "My 3A is all stainless. It looks original except for the body but when it was built in 1981 my dad said he almost got killed trying to drive it at highway speed and when he did get up there he said the engine sounded like it was going to come unglued so two days after he completed the restoration he was back to the drawing board. He bought two brand new axles from Jeep, took them to the machine shop and had the housings and axles cut down to fit the Jeep. "The stainless Jeep my brother and I went to get in New York (thanks to The CJ-3B Page) has the original axles under it but it has a Saturn overdrive. Both Jeeps have a top speed of about 60 MPH. The Jeep from New York also had a snow plow on it at one time and had hit something to bend the frame. Whoever fixed it took the plow off and sunk about two dozen welding rods into the frame. If that frame ever cracked or bent again it would be somewhere besides there. From the grill forward it looked bad. Being the only part of the Jeep where the frame was really exposed, something had to be done. "We contacted a friend who has dealt with these Jeeps for years and obtained another frame. We sandblasted it yesterday and primed it, we are going to do a frame swap as soon as we replace some worn spring hangers and fix some other miscellaneous things. This Jeep wasn't home ten minutes before we had it apart. So even aside from the bodies with my new axles with locking hubs, and his overdrive, these Jeeps are not original. I like the new axles under mine, not just for the speed but also the stopping power, this thing stops on a dime. The only problem I had was after sitting for twenty years dad forgot what year model the axles were. I played hell finding the right brake wheel cylinders. "As my dad always says, 'You can take a cuttin' torch and put a Cadillac motor in a Volkswagen'." Anon: "Real Jeeps are built not bought, so anything is okay with me, as long as it is an upgrade. As for preserving, there will always be some originals out there, but many are so far gone modifying them is the easy way to keep them running." Note: the 1953 Corvette (along with the 1954 Kaiser Darrin) was one of five sports cars of the 1950s (70K JPEG) included on a set of stamps issued by the U.S. Postal Service in 2005. Don't hold your breath waiting for a CJ-3B stamp. See also some more discussion on whether To Upgrade or to Restore.